This week’s data digest features some unique visualizations, and the big news of Hadoop 2.0’s stable release earlier this month. Foursquare is a great way to let friends know what we’re up to, or check reviews of a local restaurant. With the popularity of Foursquare, and the numerous ‘check-ins’ by users, it has a pretty good idea of what people are doing at different times of the day. Recently, Foursquare decided to use the data users give them to visualize how we move about in some major cities. They took check-in data over the period of a year, and plotted it over a map, updating it by hour of day. The result is quite fascinating, especially if you live in one of these cities. The visualization has a legend indicating a unique color for each type of check-in, and a map over which all the check-in data is visualized in the form of moving dots. Do check out the visualizations of the other cities on Foursquare. 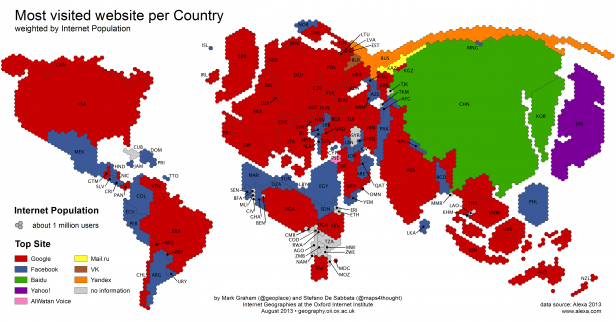 This visualization from the Information Geographies website portrays which are the most visited websites in different countries in the world. The data is from Alexa. This visualization works powerfully because of how it portrays the quantitative data of internet population. It plots internet traffic in the form of hexagons, making the countries with more traffic appear bigger. This is the first thing shown in the legend. What makes this technique so powerful is that we’re not used to seeing such a distorted map of the world, and it takes us by surprise. This surprise makes us want to dig deeper to see what kind of data is behind this awkwardly shaped map. Quantitative information can be presented in odd, yet effective ways, to communicate with data. HortonWorks, the company with the most number of contributors to the open-source Hadoop project, recently released Hadoop 2.0, which is a stable version of the beta that’s been out since the past few months. Hadoop is the most popular tool used in big data today. Naturally, this release of Hadoop is big news for the many enterprises that it’s become integral to. These updates promise to give Hadoop the next generation architecture so it can evolve quickly, and allow even more scalability for enterprises. You can read more about this in the release announcement.